Bronwyn’s Note: This has been a tough spring and I apologize for not posting Yvonne’s thoughts more frequently. Yvonne is healing well, and the daughter who is a single parent (me) is just plain overwhelmed with commitments and work. I will be working less than three jobs starting June 1, so there might be more time to get caught up on things then! I’m sorry. There has been a lot of chatter about binding spells of late, hearkening back to a time when the New Forest Witches cast a spell against Hitler during World War II to keep him off of the British Isles. This is a part of all our folklore. Binding anyone leads to many thoughts. First of all, unless performed very carefully and with a lot of preparation, this is a risky tactic. You can very easily tie your outcomes to the outcomes of the hated target until the spell is ended. Not your 90 minutes inside a circle, but until you release the target from the spell, if you remember to. If you believe in reincarnation, this could mean that the two (or more) of you wind up in the same soul group until some very powerful lessons are learned. Secondly, your emotions are very strongly felt right now. Are you certain you are in the correct frame of mind to write and conduct ritual that has intentions for the greater good of all, or more importantly, to support balance on our Mother Earth? Yes, in all rituals, we raise energy to build power, but that is with a clarity of intention that may not be all that clear right now. Thirdly, the words written recently about public binding spells read a lot like one group wishes to have power over another group. When we, the Frosts write about psychically suggesting another person turns his or her head, we are eaten alive by every person with a comfy armchair and an internet connection (also known as armchair activism). Come on, that’s a pretty self-righteous double standard. We do write about power, but as we have gained more wisdom over time, we have come to understand that “Power through Knowledge” suggests the more meaningful, “self-empowerment through knowledge.” Instead of “blossom and grow” from Edelweiss, we can think “learn and grow.” To grow spiritually, we have no need to exercise power over other beings. 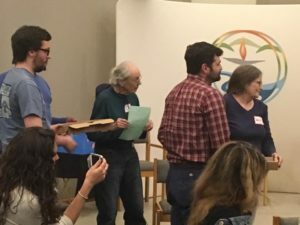 Yvonne at a social activism workshop in Charleston, WV, April 2017. Pick a topic and become the expert in that topic. A real expert, not just a social media feed expert. Know facts, know statistics, know data. Get to know your representatives in person. Get that? In person, get outside of your comfort zone and attend town hall meetings or public events where that representative will be attending. Be polite, be respectful, be coherent. If you rant and rave, you lose. You will not be taken seriously. Prepare talking points if you have to. Follow through. One conversation does not change the world, but persistence does. Finally, from our point of view, very little is a single person’s fault. Binding that person might open the door for a new, worse person to take the original target’s place. If this is not satisfying for you, research magical activism to see if you can locate trustworthy information about how to combine your faith and activism in a constructive way. We look forward to seeing you at our next “Full Moon Friday” Livestream on Facebook and Periscope on May 12. Yvonne is so excited to talk about Beltane!